MS Excel to MySQL Database Converter Software converts Microsoft Excel database records into MySQL database format. DB Conversion program supports all database data types and attributes of MS Excel during database conversion process. Now you can easily convert MS Excel database records into MySQL without writing complex scripting or coding. Converts MS Excel database records into MySQL. 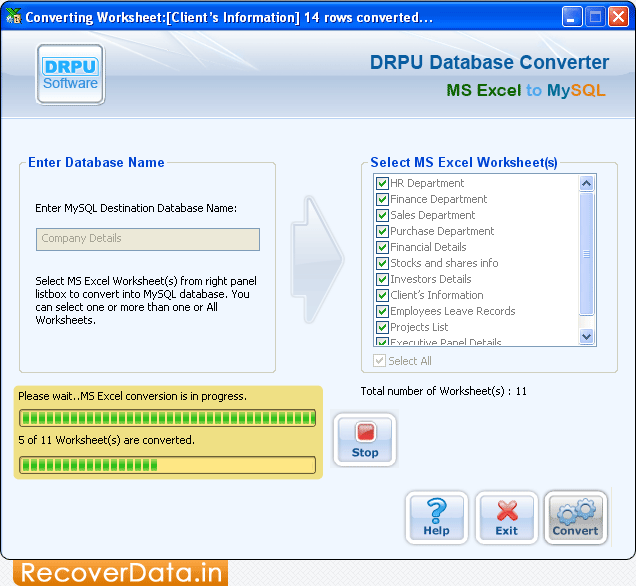 Supports all database data types and attribute of MS Excel during database conversion process. Software allow users to convert entire or selected MS Excel database as per requirement. Supports all versions of MS Excel and Windows MySQL servers. Beneficial for developers, database administrators and other users who want to convert database records. Convert database records without modifying database originality and integrity.